Whisk together the 1/3 cup brown sugar, 2 cups graham cracker crumbs, and salt in a medium sized bowl. Add the 7 tablespoons melted Kerrygold unsalted butter and stir until well combined. Press the crumbs into the bottom and sides of a 9-10” tart pan with a removable bottom. Place in the fridge to chill while you prepare the filling. 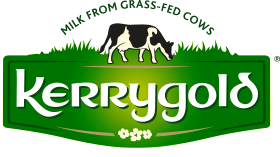 In a saucepan over medium-low heat, combine the ½ cup Kerrygold unsalted butter and ½ cup brown sugar and stir regularly until melted. Add the sweetened condensed milk and stir to combine. Stir the contents of the pan regularly until the mixture comes to a boil and then cook, stirring all the while, for an additional 3 minutes. The mixture will barely thicken and may even darken a hair. Remove the mixture from the heat. Slice the banana into ¼” coins and layer then around the bottom of the pie crust (see notes). Pour the warm toffee directly on top of the bananas and place in the fridge or freezer to chill completely. Just before serving the pie, use the whisk attachment in the bowl of a stand mixer to bring the 1 cup whipping cream, 1 tablespoon sugar, and vanilla extract into a whipped cream. Spread dollops on top of the pie and serve! As an alternative, you can pour the filling directly on top of the pie crust and then layer the bananas on top just before serving. 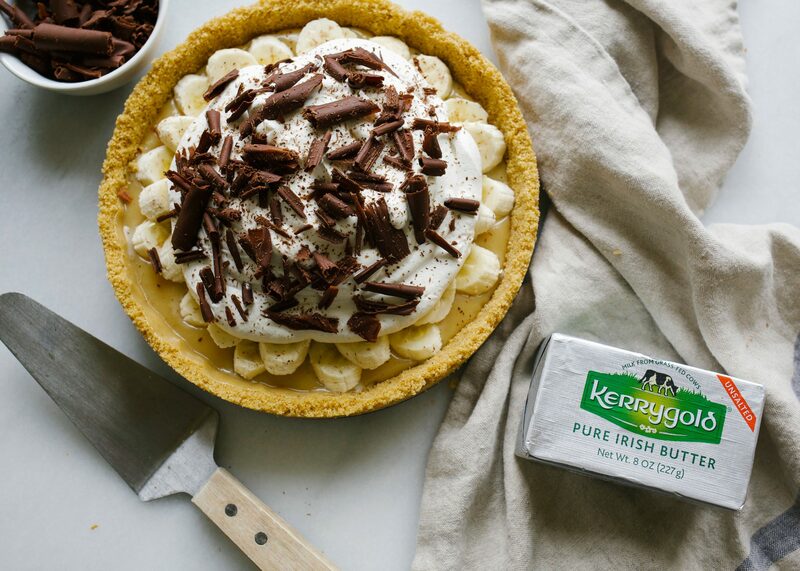 The bananas WILL WEEP inside this pie, releasing their juices and flavor. While this definitely enhances the flavor, it also makes for a messy pie. If you’re wanting slightly neater presentation, we might recommend adding the bananas on top of the toffee just before serving, but keep in mind that these bananas will still weep. The flavor is better with the bananas under the toffee in our opinion.